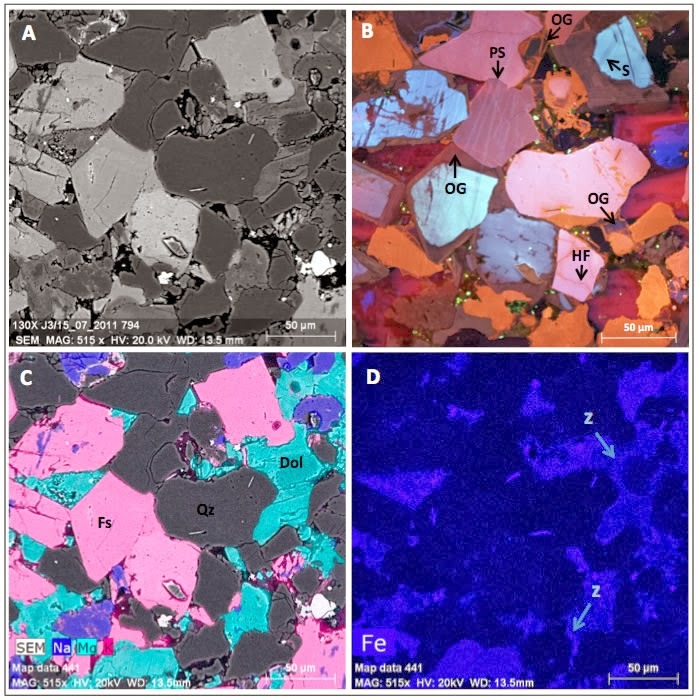 Scanning electron microscope image illustrating mineralogy and texture of unconventional gas reservoir. Note that nanoporosity is not resolvable with this image. SANS and USANS analysis is required to quantify pore size distribution and interconnectivity. Gas and oil deposits in shale have no place to hide from an Oak Ridge National Laboratory technique that provides an inside look at pores and reveals structural information potentially vital to the nation's energy needs. The research by scientists at the Department of Energy laboratory could clear the path to the more efficient extraction of gas and oil from shale, environmentally benign and efficient energy production from coal and perhaps viable carbon dioxide sequestration technologies, according to Yuri Melnichenko, an instrument scientist at ORNL's High Flux Isotope Reactor. Melnichenko's broader work was emboldened by a collaboration with James Morris and Nidia Gallego, lead authors of a paper recently published in Journal of Materials Chemistry A and members of ORNL's Materials Science and Technology Division. Researchers were able to describe a small-angle neutron scattering technique that, combined with electron microscopy and theory, can be used to examine the function of pore sizes. Using their technique at the General Purpose SANS instrument at the High Flux Isotope Reactor, scientists showed there is significantly higher local structural order than previously believed in nanoporous carbons. This is important because it allows scientists to develop modeling methods based on local structure of carbon atoms. Researchers also probed distribution of adsorbed gas molecules at unprecedented smaller length scales, allowing them to devise models of the pores. "We have recently developed efficient approaches to predict the effect of pore size on adsorption," Morris said. "However, these predictions need verification – and the recent small-angle neutron experiments are ideal for this. The experiments also beg for further calculations, so there is much to be done." While traditional methods provide general information about adsorption averaged over an entire sample, they do not provide insight into how pores of different sizes contribute to the total adsorption capacity of a material. Unlike absorption, a process involving the uptake of a gas or liquid in some bulk porous material, adsorption involves the adhesion of atoms, ions or molecules to a surface. This research, in conjunction with previous work, allows scientists to analyze two-dimensional images to understand how local structures can affect the accessibility of shale pores to natural gas. "Combined with atomic-level calculations, we demonstrated that local defects in the porous structure observed by microscopy provide stronger gas binding and facilitate its condensation into liquid in pores of optimal sub-nanometer size," Melnichenko said. "Our method provides a reliable tool for probing properties of sub- and super-critical fluids in natural and engineered porous materials with different structural properties. "This is a crucial step toward predicting and designing materials with enhanced gas adsorption properties." Together, the application of neutron scattering, electron microscopy and theory can lead to new design concepts for building novel nanoporous materials with properties tailored for the environment and energy storage-related technologies. These include capture and sequestration of man-made greenhouse gases, hydrogen storage, membrane gas separation, environmental remediation and catalysis.